This Memorial Day event is a special service to remember our nation’s servicemen and women. It’s a tribute to those who gave their lives in service to our country and a celebration of those who currently serve or have served our nation. 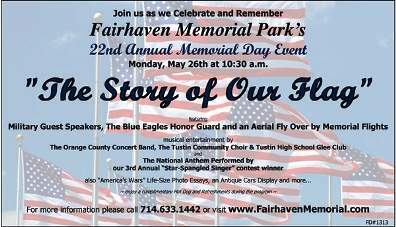 Featuring live entertainment and patriotic speakers, the Memorial Day Service is a wonderful reminder of what it means to be an American. Fairhaven Memorial Park was created in 1911 by the visionary, Oliver Linden Halsell. Several other business people in the community assisted with this endeavor, including Horatio Forgy. The park was created as a Memorial Park versus a cemetery. Memorial Parks are distinguished by flat markers versus upright markers, so that the visitors to the park feel as if they are in the quiet solitude of a park, with the expanse of green lawns and the splendor of majestic trees. Halsell developed the park for the living, where families could come and visit their loved ones in a park-like setting. Halsell had no children, so before his death, he created what is now known as the O.L. Halsell Foundation. The Foundation supports charities throughout Orange County and owns a large part of Fairhaven.